This has been the week of green curry. I brought home a can from Tian Phat on Monday and have been trying to use it in a variety of ways since. 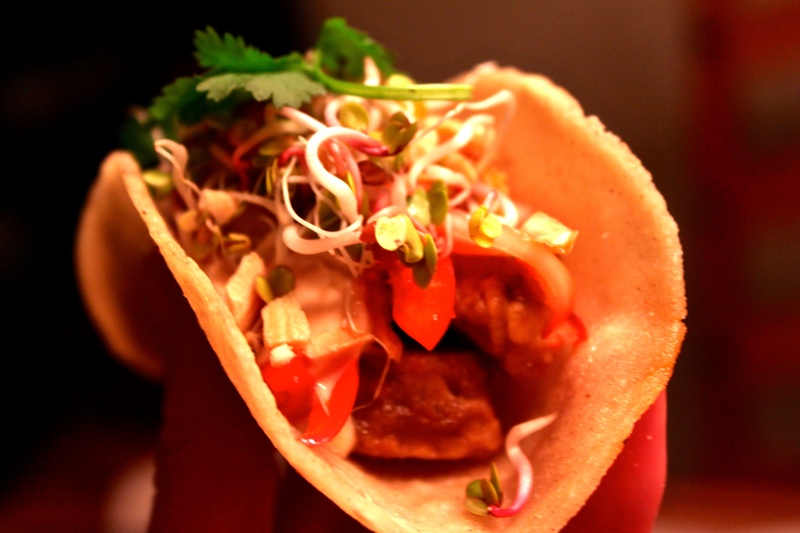 My favourite, so far, has been these green Thai curry-marinated tempeh tacos. You could easily make this recipe with the meat or seafood of your choice, but I think it’s delicious with tempeh or tofu. 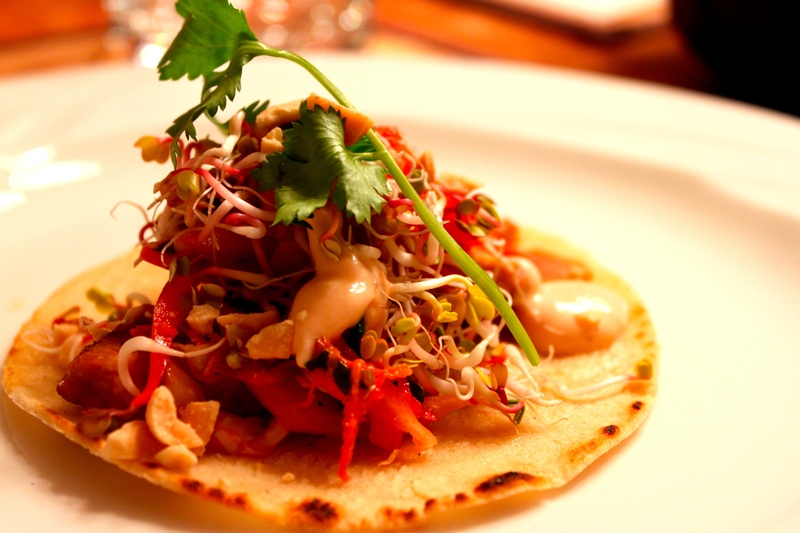 Grilled masa corn tortillas + green Thai curry and coconut-marinated tempeh + spicy “Asian” slaw + Sriracha-citrus yogurt + daikon sprouts + crumbled peanuts + fresh cilantro = delicious fusion tacos. This is my second run at fusion tacos, because as most of you know I am obsessed with the bulgogi style tofu tacos at Indochine Banh Mi on South Park Street. I tried recreating those once and something just wasn’t right. These are different, with the Thai curry influence, and I was extremely happy with how they turned out. I’m putting them in regular dinner rotation, maybe switching up the protein now and again. The marinating did take a little bit of time, but it was completely worth it. I’m not going to do a full recipe, just give you the basics. 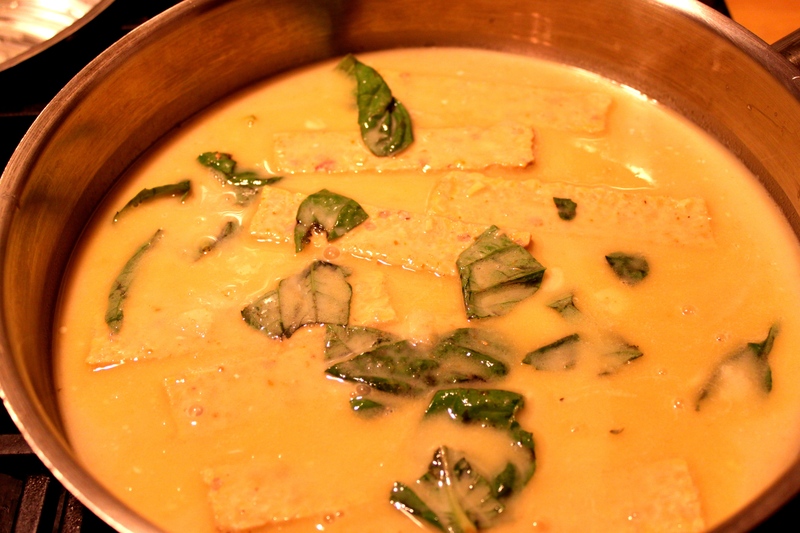 The tempeh marinade consisted of rice wine vinegar, sesame oil, lemon-infused olive oil, soy sauce, lime juice, freshly squeezed blood orange juice, fish sauce, green curry paste, more fresh ginger and garlic, fresh basil and of course coconut milk. I let that sit, sealed, for a couple hours. The cooking method to really infuse the flavour into the tempeh is to then put it on the stove, cover it in the marinade, bring to a boil them simmer for about 20 minutes. After that, jack the heat and let it completely reduce to nothing. 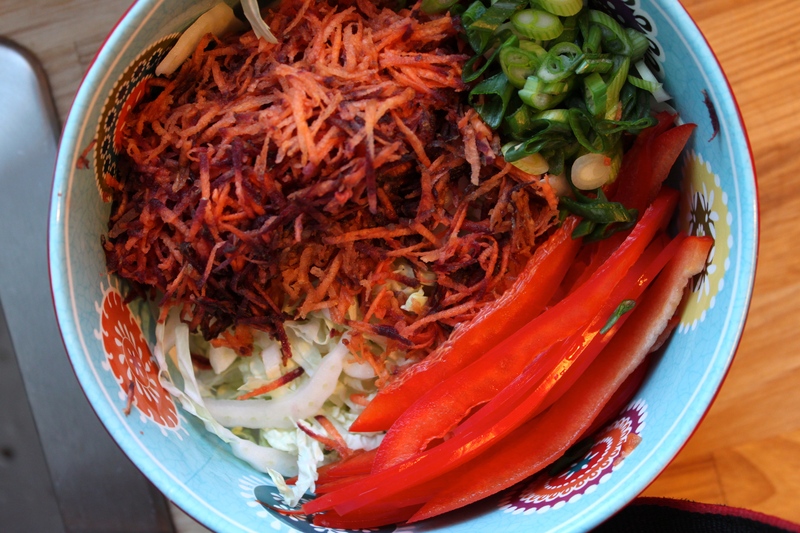 The Asian slaw I made had sliced napa cabbage, grated carrot, green onion, red pepper and cilantro. The dressing was hot (and tasted SO good the next day) with chiles, fresh ginger, rice vinegar, lime juice and lemon-infused olive oil. The Sriracha-citrus yogurt is simple, I used a mixture of Fox Hill plain yogurt, store-bought greek yogurt, Sriracha, lime juice and my secret ingredient, roasted garlic oil. Add your favourite Asian-inspired toppings and you’re good to go. I found amazing daikon radish sprouts at Selwood Green last weekend and they were perfect; those along with crumbled peanuts and fresh cilantro, and these were some spicy, yet beautifully balanced tacos. Thanks to the Seaport Farmers’ Market I was able to use mostly all local vegetables, and grab fantastic handmade corn tortillas from El Gallo. Cover in marinade, bring to a boil, them simmer for 20 minutes. Jack up the heat and reduce ALL the sauce! So much flavour. Get your toppings in order. Since it’s January, I, like everybody else, am trying to eat a little bit healthier. Since I already do almost all my cooking from scratch and generally feel pretty good, it’s more about using nutritious ingredients that I’m not overly familiar with, and expanding my repertoire. So, lentils. We’ve got a ton of them in our pantry, and they’re still not my number one choice, simply because I don’t entirely know what to do with them. I’ve come to love the brown variety; they are extremely easy to cook. There are just a couple tips about lentils that I’ve come across, including that you should always rinse them off beforehand, and that you should wait to salt them until after they are cooked (or they might get mushy). Other than that, lentils seem pretty easy-going. I haven’t overcooked them yet, or burned them to the bottom of the pot. 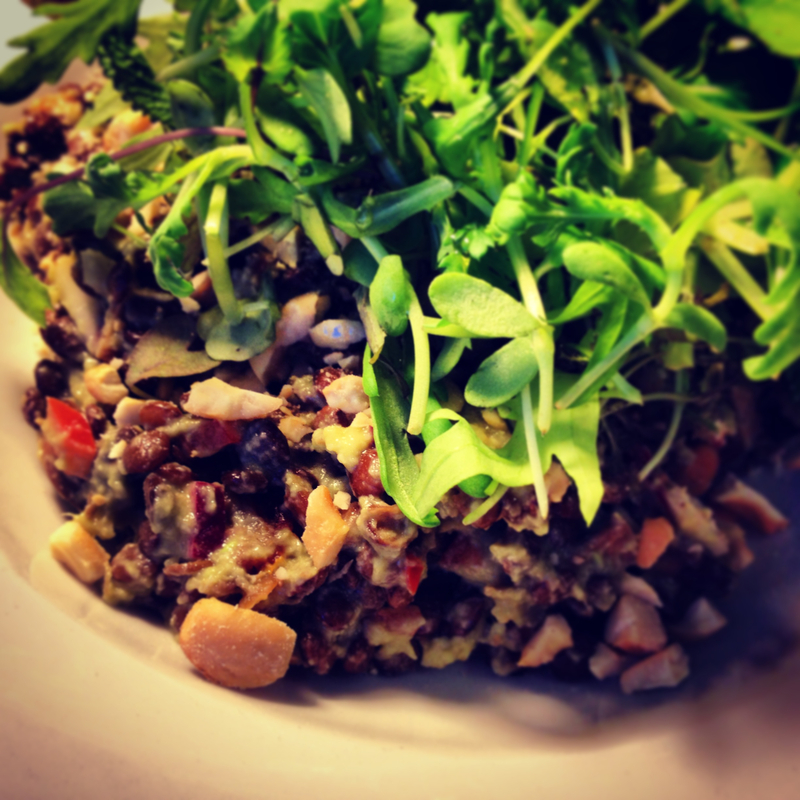 Creamy lentil salad with avocado-lemon dressing, and cashews. For one. As a note, the ratio for lentils to water is 1:2. They only take about 20-30 minutes to cook. Bring them to a boil then simmer, uncovered, for the rest of the cooking time.